So hitting the pumpkin patch this weekend was just what I needed - which then inspired me to get back to working in the kitchen. Goodness it was gorgeous out - but goodness were those fresh farmer's market pumpkins, peppers, and greens tasty-looking! Can you believe this Zucchini?! It makes me look like an ant! As far as I've been staying away from grainy-carby-things like flour for the last several weeks of my bikini competition, now two weeks out, I still couldn't escape the fact that these awesome ingredients deserved a REALLY tasty recipe. Not just any recipe. Something that would be as comforting and delicious as it was transportable. After all, us Tucsonians are so anxious to get back outdoors, we're practically leaving the front doors open. Soaking up the sun! Just like these here sunflowers! Such a gorgeous October day. 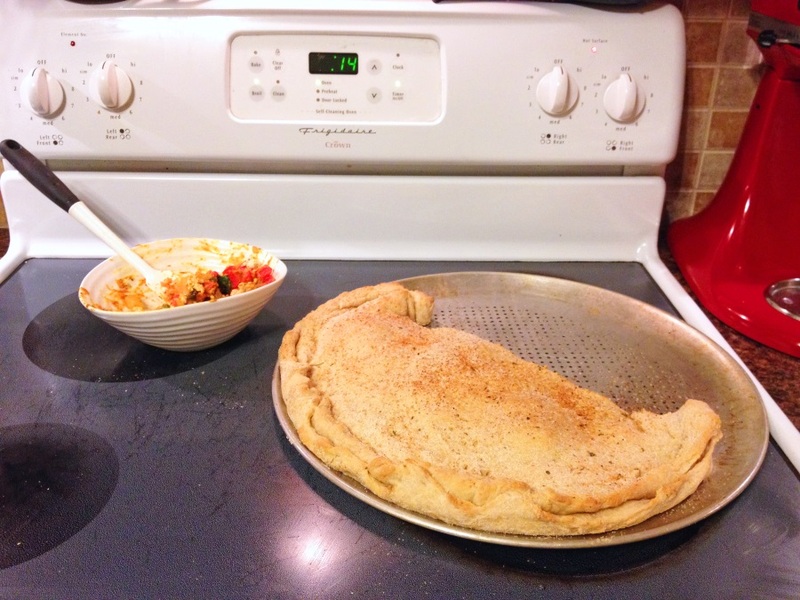 Hence, the Harvest Picnic Calzone. We've got to enjoy this sort of deliciousness al fresco to really appreciate it! By the way, I did actually eat some of this! I had a good chunk of the actual bready stuff (couldn't help myself, it smelled too darn good) and put some of the filling and turkey on top of a low-carb tortilla to make a thin-crust pizza, too. In a stand mixer or large bowl, combine the water, yeast, and sugar. Allow the yeast to wake their sleepy selves up for about five minutes. The water should become cloudy as they make short work of the sugar in the bowl. Set a timer for 30-60 minutes and allow to rise until about doubled in size. While the dough is rising, shred the cheese and prep the veggies. Heat a large pan over medium heat + spray with canola oil cooking spray. Once the pan is hot, saute the diced bell pepper, onion, habanero, and garlic. Add a bit of salt + pepper. Cook, stirring every minute or so, for about 5 minutes, until the veggies begin to soften and become fragrant. Add the sage, pumpkin, chicken stock, leafy greens, and spices. Cook just until the greens are just wilted. Transfer the filling to a bowl. Reheat the pan with a bit more cooking spray + add the ground turkey. Season with more of the salt/pepper/nutmeg/sage if you like, and cook completely. Remove from the heat when done. Meanwhile, (after removing the dough from the oven if it was rising there) preheat the oven to 450 degrees F.
Roll out the dough into a large circle - or two medium circles - as if you were making pizzas. Try to make it fairly thin. Fill half the circle with as much filling and turkey as you like - or as much as you can! - and top with cheese. Be sure to leave room near the edges. Fold the untopped side over the filling and roll up around the edges to make a crust. If no holes naturally appear in the top, poke with a fork or knife to allow air to escape. Spritz the top of the calzone with cooking spray + sprinkle with salt + garlic. Bake about 20 minutes, until the crust is completely baked and lightly browned on top. Cut into wedges and serve melty hot, or pack up for an easy picnic lunch!